Sometimes I am pushed to do things I don’t understand, to push myself beyond all reason into a fight beyond all courage. To find that edge in myself where fear gives way to something . . . else. What else? I guess that is what I seek to discover. When I was young it was surfing, paddling out into ocean waves, being challenged by their power and unpredictability and ultimately being humbled by their strength and relentlessness. Big waves challenge us to our core: speaking about Maverick’s, a dangerous big-wave surf spot, Grant Washburn said riding waves there was “a primal Jolt to our inner selves, making us feel alive like few things in the modern world.” In my 40s I was hiking out into the wilderness, fasting for days on end in solitude with nature, seeking the battle within, fighting with my demons to be a better person. Now, in my late 50s I still feel that familiar tug but I am motivated to teach, to share my experiences, my battle is to grow my world, expand my compassion, to let go of my earthly desires. Searching for the Heart of Darkness. Now, I know what you must be thinking. This is macho stuff, pure testosterone, prove my worthiness, satisfy my ego, my lack of self confidence. And maybe a part of it is, but I believe it’s also much more. This storm I believe is in all men, and in some ways, all women, but it is manifested differently in each. 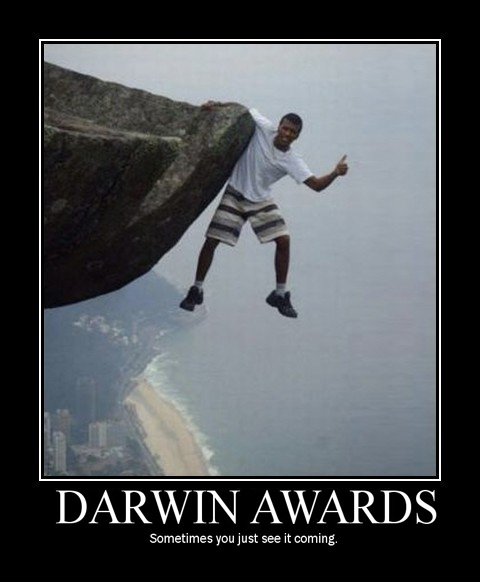 Think about this: a recent study of 10 years of Darwin Awards, distinctions for people that “must show an astounding misapplication of common sense” that results in their own demise, revealed that nearly 90% of the recipients were men. Many of these incidents clearly involved idiots but the researchers also concluded that: “It is puzzling that males are willing to take such unnecessary risks — simply as a rite of passage, in pursuit of male social esteem, or solely in exchange for ‘bragging rights.” Why is that, you might ask? This behavior, to seek a rite of passage, to face their fears, I believe is the warrior* spirit in all men, however poorly or well developed. The warrior is one of four male archetypes, basic instinctual patterns that form the foundation for the behavior of all men. Jung was the first western scientist to give them a name but they have been known since time immemorial. When I discovered them, or rediscovered their energy in my 40s, I felt immediately at home. They were my directions in life, my compass. But I quickly learned that without balance the directions can be, well, misdirections, catastrophes, so balance is the challenge, but first there must be understanding. *[Note: the terms warrior, hero, king, magician and lover are used in many ways. Here they are meant to describe personality instincts, not necessarily the physical personifications described in our modern culture]. King, Warrior, Magician, Lover — the male archetypes. Lover, warrior, magician, king; yellow, red, black, white; eagle, mouse, bear, buffalo; love, courage, introspection, wisdom; spring, summer, fall, winter; east, south, west, north. These are the four elements of the sacred circle of life, a mandala for the mind, repeated in colors, animal spirits, seasons, and directions. 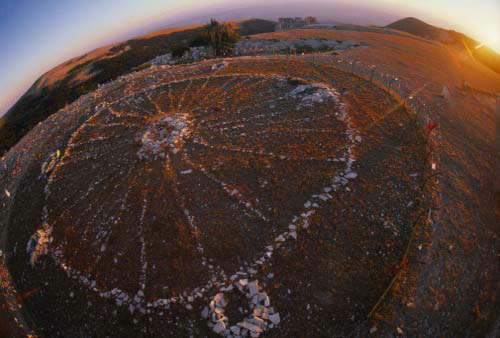 We see them in the medicine wheels of First Nations, in the Hill at Tara, at Stonehenge. These are representations of Jung’s collective unconscious, forms of the psyche that have always existed in everyone. They are not developed individually but inherited, perhaps genetically, from our ancestors as archetypes and expressed in different ways in our personality. We only know them directly in our myths and legends as they repeat, over and over, the pattern of human psychology buried deep in our souls. Luke’s Vision. Frodo and the Ring of Power. Joseph Campbell taught us that mythology is a projection of the unconscious, stories we repeat in our lives as legend, folklore, and ideology. These myths take their specific shapes from the individual’s cultural environment but certain images are found to recur in people widely separated in time and space, images that have a common meaning or elicit comparable psychological responses and thus serve similar cultural functions. The Hero’s Journey, for example, where we venture forth to kill our Dragon — a metaphorical battle of the heaven (a bird) and hell (a serpent) within us all — and return to enlighten mankind with our new found knowledge. In our modern culture this is Luke in Star Wars, facing his greatest fear in the cave on Dagobah, which is not Darth Vader, but his fear of turning into Vader, turning to the dark side. This is also Frodo in Lord of the Rings, his greatest fear of succumbing to the ring of power, yet he carries it towards its destruction. Each man on an impossible journey but ultimately only fighting their inner desires to gain power by denying power for themselves. But for every King there is a tyrant, for every Magician a manipulator, and for every Warrior a masochist. The key to harnessing the energy of a healthy archetype is making the transition from boy psychology to man psychology. Many of our global problems are from men in power with archetypes gone awry; manifested as crippling psychological problems and subsequently creating tyrants, despots and dictators. Instead a mature man must transcend (not destroy) his boy psychology and assume the energy of the man. In boys, these warrior shadow energies can be manifested as the “Grandstander Bully,” an individual so insecure they try to impress everyone with their power and thus take enormous risks and try to dominate those around them, or the Coward, an individual that runs way from their problems but may eventually erupt in violence and assault his enemies. The character portrayed by Tom Cruise in the movie Top Gun is a good example of the Grandstander Bully: he listens to no one, takes enormous risks, and eventually hurts himself and those around him. The apex of boy psychology is the Hero, an individual that believes he is immortal and can fight the unfightable foe and win. Clearly both are impossible but in boys this is a romantic fantasy but appropriate energy for their age. In men it can be disastrous and explains many of the problems in modern society: men trapped in boy psychology; immature men that live as bullies, cowards or heros. Ultimately, however, for a man to reach his full potential he must capture the energy of the mature, well-balanced Warrior. An unbalanced Warrior, although transcending the boy, can still exhibit the shadow behaviors of sadists and masochists. The mature Warrior, on then other hand, doesn’t back down from fear but isn’t a fool either. His actions are solely to achieve a purpose, never overdone or dramatic; he know what he wants and is willing to suffer to achieve his goals. The difference between the Warrior and the Hero is that the Warrior is smart, and knows his limitations. He doesn’t have romantic images of invulnerability but the clarity of knowing his capacities and limitations. These are the great warrior traditions of the Spartans, the Samurai, of the Native American warriors who defended their people against overwhelming odds, and in modern culture of Luke in Star Wars. But again balance within the Warrior is key or one can become a powerful shadow warrior, such as the sadist Darth Vader. Balance must also occur with the other archetypes such that the Warrior’s dispassionate nature is tempered by the Lover’s compassion, and so on. Balance both within and among archetypes leads to a mature man, one with the storm inside, but who channels the power of the storm to help others, to protect the defenseless, to love the loveless, and uses his leadership and intellect to set an example for others. But there are ways to experience these empowering rituals and many men naturally seek them in their lives. It could be hiking into nature, seeking life challenging experiences, working with a therapist, seeking a modern initiation experience, participating in a men’s or couples workshop, meditation, or oddly enough, simply living a life open to change. Links to some possible paths are listed below. I have personally experienced all of these to varying degrees and they have enriched my life and helped me to be a better person, a better husband, father, teacher and citizen. It has helped me to channel the storm inside into something constructive…and avoid being an idiot.